Are you confused in choosing between P90X vs Insanity? These two workout programs are both from Beachbody, and they are both widely considered as “extreme” workouts that can bring your body to the next level. Even so, you have to understand that these two workouts are not the same. There are several important differences. Below, we will see the detailed comparisons between P90X and Insanity to help you choose the right workout program. First of all, let’s understand the goals of P90X and Insanity. You should consider whether you only want to lose some weight and cut down some inches from your stomach, or if you want to go further and build lean muscles. You may be interested in both goals, but you should choose one as the priority – you may want to prioritize weight lose so that your lean muscles will be more visible. P90X is more suitable if you want to build lean muscles. But it is not the best choice for burning the calories. It is primarily a weight training, with some cardio days mixed into the routine. P90X is actually an excellent choice for building strength, too, as it has specific moves that are dedicated to the arms, legs, shoulders, and back. P90X is great for people who love weightlifting and anaerobic exercises. On the other hand, Intensity focuses more on cardio, which delivers direct weight loss effects. It is an intense cardio workout with resistance training exercises sprinkled into the routine. This workout program is great if your goal is to shed some pounds and inches. Insanity is great for people who love aerobic exercises such as running and cycling. 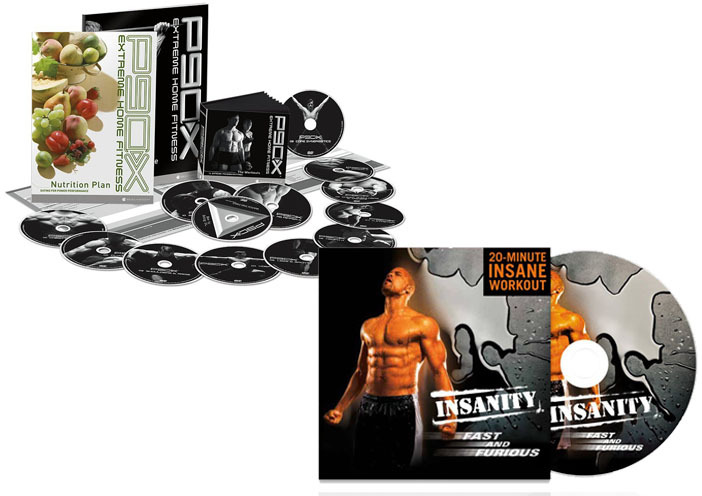 Take a look at our previous post about Insanity vs Insanity Max 30 here! Both P90X and Insanity do not require a significant amount of space. Even a medium-sized bedroom would be sufficient. However, P90X may require you to have more space and spend some more bucks if you don’t already have weights, dumbbells, and a pull up bar, as it involves those pieces of equipment. On the good side, these things are not expensive and can be found easily. On the other hand, Insanity does not need the use of any equipment; for resistance exercises, you will use your own body weight. Finally, you should also consider the time requirement of P90X vs Insanity. If you can devote at least two hours daily to working out, you will have no problem in fitting either of the two workout programs in your schedule. Both P90X and Insanity have short and long workout days. However, P90X’s exercises generally take longer, with the shortest ones being between 40 – 45 minutes. Meanwhile, Insanity’s exercises are relatively shorter, with the shortest ones being between 30 – 40 minutes. If you seriously want to build lean muscles and strength, you should go with P90X. This workout is more focused on weight training, and it requires more tools and time. However, if you just want to cut down some pounds and inches, or if you just want to keep in shape despite your tight schedule, Insanity is more suitable.